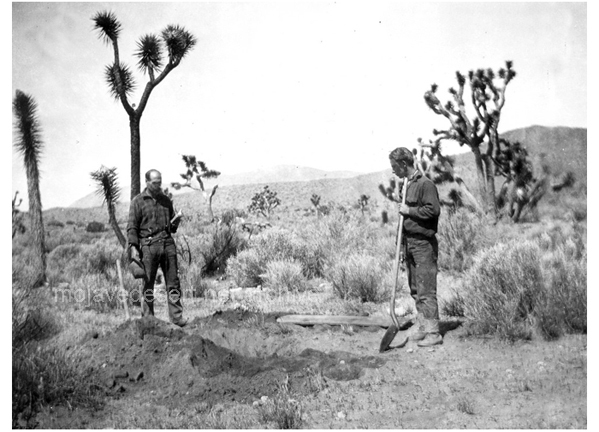 Bill Keys was the one who found Johnny Lang dead, wrapped in a tarp at the top of Lost Horse Valley in what is now known as Joshua Tree National Park. Johnny spent his last night, probably hungry and cold, on his way to get supplies to take back to the run down shack he lived in further up the canyon toward the Lost Horse Mine that he once owned. Despite the rumors of a secret cache of gold Johnny had hi-graded from the mine, he had nothing more than a piece of bacon in his pocket to chew on during his journey to the store. Bill Keys, noted area rancher, had found the body, reported it and was instructed to bury the undernourished old man. He would be paid by the coroner for such service. Keys, dug a deep enough hole, laid Johnny’s corpse in it, set a grave marker and threw dirt over the affair. As Johnny’s legend regarding possibly hidden gold grew, someone foolishly went out and dug up the grave to see if his gold had been buried with him. It had not and Bill went out and finished the burial, again. Years later Johnny’s body was again dug up–with a backhoe. This time, however, his skull was stolen. Johnny was reburied. This time the grave marker was placed away from the grave to hide the exact location, and that seems to have taken care of the problem. … This time.